The following students are each winners of a prize from our store! We hope you enjoyed the challenge and that you will continue to play and learn at GregTangMath.com. Congratulations to all students who completed the challenge! Current Challenge: Greg Tang's Spring Math Challenge. A math challenge bracket for students to complete in March & early April, using the online games and books at GregTangMath.com. Students who complete the challenge can be entered into a prize drawing by their parent or teacher. 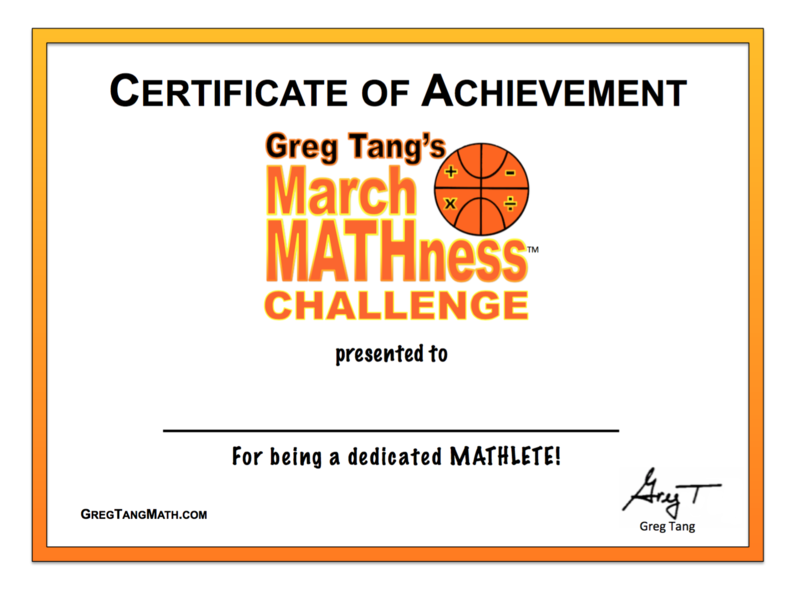 3 Individual students will win prizes from Greg Tang Math. Click here to enter! All students who complete the challenge earn a certificate of achievement which can be printed by clicking here. Tweet a picture of your students with their certificate for a chance to be featured on our homepage twitter feed! Teachers and parents can provide their own prizes for students who complete the challenge. Kids in grades K-6 and above can participate in the challenge. Any teacher or parent can fill out the form for the prize drawing. Starting March 18th and ending April 8th, 2019. Print the grade level bracket. After the bracket is completed, enter student names for the drawing. See the instructions at the right for more detailed information. Students learn and practice math skills while at school and away from the classroom! •Click here to download the basic parent letter word document that you can edit. Click a link below to download the PDF formatted bracket. Note: If you can’t open the files, try downloading Adobe Acrobat Reader. Brackets with no grade level listed (0=Kindergarten, 1=First Grade, etc.). Fill out entry form once student game board has been completed. ✔ Print the bracket and make copies for each child. ✔ Give each child a bracket in March. ✔ Remind the students to return their completed brackets by April 8th. ✔ After completing the bracket - Print certificates for students who complete the challenge. ✔ Fill out the online entry form by April 5th to be eligible for the prize drawing! ✔ Follow the directions on the bracket. ✔ Get help from Mom or Dad (or someone else) if needed. ✔ Move to a higher or lower level of the game if needed. ✔ Have FUN, while learning & practicing math! ✔ Return their completed bracket by April 9th, 2019.